“Hal Wissel is an outstanding teacher and coach and has many years of experience coaching, and scouting in the NBA. He knows what he’s talking and writing about. His book will help players improve and help coaches teach.”– Phil Jackson, Basketball Hall of Fame, 11-time NBA Champion coach. 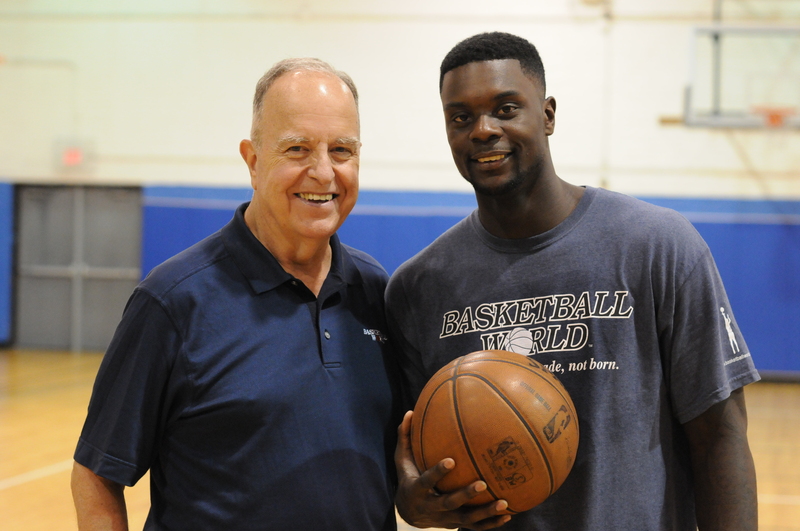 “Hal Wissel’s personalized teaching helped me improve my free throw shooting, three point shooting, quickness of release and post-up ability.”– Dale Ellis, NBA All-Star, Ranks fifth in NBA Career 3 Pointers, over 40 percent three-pointers. “During the 2015-16 season Hal helped me improve my three point shooting 11.5 percentage points to a career high of 37.8. During the 2016-17 season Hal helped me improve my three point percentage to a career high of 39.2 percent, second best on team. Hal also helped me improve my my field goal percentage 3.7 percentage points to a career high of 46.7 percent. Hal also helped me to create my own shot off the dribble..– Glenn Robinson III, Indiana Pacers. – Harvey Blom, Coach and Promoter, The Netherlands. “My daughter Meg received personal instruction from Hal and Paul Wissel. Since our workout, Meg did her 20,000 shots in 20 days (it actually spread out over 27 days). Her shooting improved incredibly, but more important she believes in herself. She has a better understanding of her own shot. After a miss, she corrects her own shot with a positive word and visualizes a good shot. Meg’s confidence level when she steps on the court is off the charts. Thank you both for all of the above. Coach Hal Wissel has developed a great teaching video that is applicable to both coaches and players. ‘Basketball Shooting: Confidence, Rhythm, and Mechanics’ is an inside peek at one of his Shoot It Better mini-camps. Watch the instruction and teaching in live action as players are performing drills and exercises. As it says in the title the video deals specifically with developing and improving a shooter’s confidence, rhythm and mechanics. I found this one of the most informative videos on teaching shooting that I have viewed. Coach Wissel not only discusses the value of being a confident shooter with good rhythm and mechanics, but he demonstrates ways and ideas to improve in those three areas. We all know it is important to be confident and Coach Wissel shows us how to develop that confidence. The use of key words and positive ‘self-talk’ is a wonderful instrument for shooters to follow. Another great aspect of this video is all of the shooting drills that are demonstrated. Obviously, we always need to practice shooting, but Coach Wissel utilizes many ‘cutting-edge’ warm-up and lead-up shooting drills to improve the mechanics of a shot. Overall, this is a great video and teaching tool. Confidence and mechanics are certainly aspects of a shot that we all want and Coach Wissel teaches shooting in a way that doesn’t simply tell us to be confident, but shows us how we can develop the confidence and mechanics necessary to become great shooters through utilizing key, positive words and excellent shooting drills. This is a must-have video for any coach that wants to improve team shooting and for any player who wants to become a more confident, higher percentage shooter. – Tony Alfonso, Hoops U. Basketball Shooting: Confidence, Rhythm and Mechanics is the first of Dr. Hal Wissel’s DVDs on shooting and it will show you how Coach Wissel integrates breakthrough mental and mechanical techniques to improve shooting confidence and skill. Coach Wissel explores the psychology of becoming a great shooter and provides physical actions and auditory triggers (key words) that teach players how to “act like a shooter”, bolstering confidence, while eliminating negative thinking. Holding the follow-thru until the ball is in the hoop and achieving a free-flowing rhythm are keys. The role of the index finger is something new that I took away from the video. The shooter is taught how to become his own coach and how to correct errors. Many drills are provided. Free-throw shooting tips are given. Tips for coaching shooters are given. I enjoyed and highly recommend this DVD. Basketball Shooting: Off the Pass, Off the Dribble and In the Post is the second of Dr. Hal Wissel’s DVDs on shooting and is more advanced and takes the player to the next level. Perimeter players will learn how to properly catch the pass so as to be in correct position and ready for the quick release and shot. Learning to shoot off the dribble, off the cross-over, and off the shot-fake are demonstrated. There are pointers on how to shoot when coming off screens, as well as how to correctly use the screen. Various chair drills are included. Post players will benefit from this video as well. The detailed instruction on the hook shot is the best I’ve seen. Several important post moves are demonstrated including pivoting moves to the baseline and to the lane, and one-dribble moves to both the baseline and lane. I highly recommend this DVD for players wanting to move to the next level. Hal Wissel is one of the best shooting instructors in the world. There are very few people on this planet that can analyze, break down, improve and develop a players shot or team shooting in a motivating, simple and logical way. When I was hosting the All Star Weekend in The Netherlands all of the 100+ coaches where impressed with the drills Hal Wissel showed on improving a basketball team. But he really left his mark on the young athletes that he, Paul and Scott personally instructed during there BASKETBALL WORLD Shoot It Better Mini Camps. Some of these athletes have improved their shooting in such a way that they are playing at a professional level. I would recommend that coaches get Hal Wissel to improve team shooting and players attend his shooting camps. Oxford HOOPS Basketball Club uses your teaching and techniques to help all our players and indeed coaches improve their teaching on how to shoot and players learn to correct their own shot. We think that you are the best! I have not been lucky or privileged enough to have attended one of your clinics, but I have the DVDs and have studied them in great detail, experimented with different options and alternatives, really looked into players movement and action to see if your system would help improve our shooting percentage. I can tell you that categorically, those who have been wise enough to use your system and young enough to make the changes have improved their shooting percentage by approx 20%, but better than that, it has improved their speed. By this, I mean getting into that perfect shooting position to release the ball with minimum disruption. Last season (2010-11) our development team won the Shield Finals (the year before that they were 2 from bottom) and our main team won the Cup Finals, all our Under 17 teams either won their respective leagues or came in Runners-up. “Shoot it Better” has been a great help. I can also tell you that we have managed to achieve this with little court time, as you know in the UK very few Clubs actually own their own facilities, which means that we rely on court availability and funding. I can only imagine what could happen when we get our own facility and we are able to work on shooting on a daily or even weekly basis without having to worry about the time spent on it. The time is coming … 2014 and we’ll have our own facility! Thanks. Loved the video Correcting Basketball Shooting Errors! I especially liked how you broke down all the potential problems of a missed shot and gave verbal cues as a reminder to the player to correct them. I agree that speaking what you want to perform can trigger verbal cues that translate into proper technique.